YES, this is our Famous All in one Spice! Spoon it on! Get rid of that Salt and Pepper shaker! 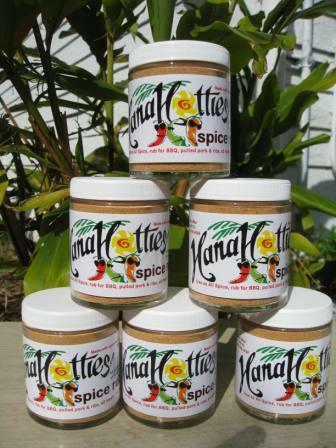 Made with Hawaiian chili from Hana Maui, specially blended with Gourmet premium smoked paprika, herbs and spices. Sprinkle on everything, no need to trouble yourself gathering a bunch of different spices. We have made the perfect blend for you. Originally developed as a spicy rub for BBQ pork, BBQ chicken and grilled fish, we found that it was perfect to use as an all purpose spice. This All Purpose Spice can replace the salt and pepper shaker on your dining table too. Share it with your friends and family they will love you for it!! Perfect for blackened fish, season that steak for the grill, put it on baked potato, in chili (any bean dish), sky is the limit with this spice ! Ingredient; Smoked Paprika, Hawaiian sugar, Hawaiian Sea Salt, Garlic powder, Onion powder, Ana chili, Hawaiian chili, lemon peel, cumin, thyme, oregano, Black and white pepper. 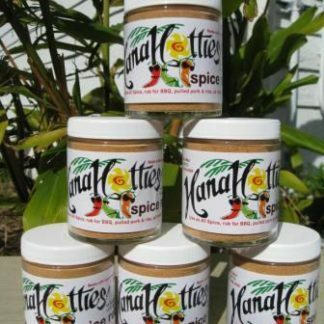 Available soon for our HanaHotties fans, who love that little KICK , look for a HOT version of the this spice in the very near future.